Debra Rushfeldt was born in Calgary AB, Canada and received her art education at The Alberta College of Art and Design, The Banff Center, and summer studies with Parson's in Japan. She has been exhibiting locally and nationally, teaching art workshops, and volunteering with art organizations since the 1980's. In 2010 she was granted a Major Project Award from Columbia Basin Trust to develop a series of artworks that would highlight life in the West Kootenays B.C., thus beginning her interest in drawing with charcoal. Debra's prolific mixed media assemblage practice comes from an aesthetic that is largely subjective and informed by her found object collection, and her attraction to rich and sensual surfaces. 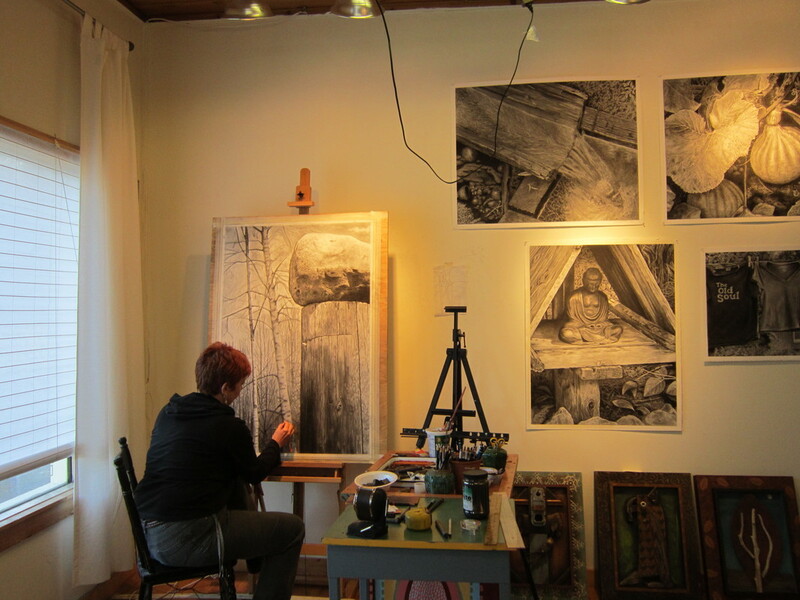 Her realism based charcoal drawings are inspired by her emotional connection and understanding of her surroundings. All her painted and drawn artworks are linked by an interest in the found object, and binding the ordinary to the extraordinary. She is represented in numerous private and corporate collections throughout Canada. Currently she resides in the small mountain village of Nakusp B.C. where she owns and operates Debra Rushfeldt Studio Gallery, and finds inspiration everyday in the pristine beauty of the area.